Koppel was born in 1919 in Berlin and sought refuge from Nazi persecution in England in the 1930s. He mixed in émigré circles in London, training under Martin Bloch and showing work at Jack Bilbo’s Modern Art Gallery, and later the Beaux Art Gallery. Koppel moved to South Wales in 1944, working as an art teacher in a school for workers and their families until 1956, then returning to London, teaching at Camberwell and Hornsey Schools of Art and lecturing at Liverpool College. He spent his final years in Aberystwyth. 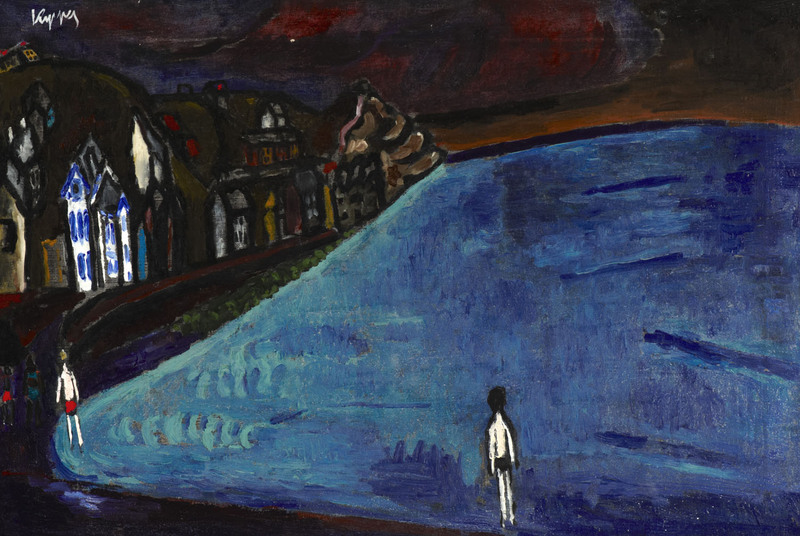 Koppel depicts the tiny West Cornwall village of Sennen in a typically naïve, almost surreal, style though his treatment and distinctive colouring also reflect a debt to German Expressionism. A psychological element is introduced by the dominant bend of the cove and its great blue stretch of water which threatens to swallow up the houses and overwhelm the two small boys.